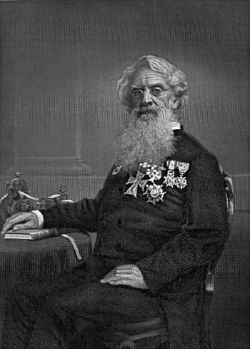 Samuel Finley Breese Morse (April 27, 1791 – April 2, 1872) was an American, a painter of portraits and historic scenes, and is credited with the invention of the first telegraphic communications device to enjoy widespread use in Europe and America. 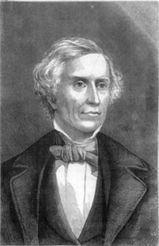 Samuel Morse was born in Charlestown, Massachusetts, the first child of geographer and pastor Jedidiah Morse and Elizabeth Ann Breese Morse. After attending Phillips Academy, Andover, he went on to Yale. He devoted himself to art and became a pupil of Washington Allston, a well known American painter. While at Yale College, he attended lectures on electricity from Benjamin Silliman and Jeremiah Day. He earned money by painting miniature portraits on ivory. In 1810, he graduated from Yale University. Morse accompanied Allston to Europe the following year. While in Europe, Morse also studied under famed portrait painter Benjamin West. He won awards for his art work, but was forced to return to America in 1815, due to lack of funds. Once back in the states, he opened a studio in Boston, where he painted portraits. Among the famous people who sat for him were Eli Whitney, inventor of the cotton gin, and U.S. President James Monroe. He was also practiced in painting monumental themes, among them being his work, the Old House of Representatives. In 1819, Morse married Lucretia Pickering Walker in Concord, NH. The couple had four children. Mrs. Morse died in February of 1825, while Morse was in Washington, D.C. It is said that his inability to find out about his wife's death or even attend her funeral became an impetus for his work on the telegraph, which would have informed him of the event sooner had it existed at the time. In 1825, his career in portrait painting was given a boost when he was commissioned to paint a full-length portrait of the Marquis de Lafayette (a military hero). A year later, he founded the National Academy of Design, an organization promoting the visual arts, and became its first president. Morse returned to Europe to improve his painting skills, traveling in Italy, Switzerland, and France, from 1830 to 1832. His most important work during his sojourn was to paint miniature copies of some 38 of the Louvre's famous paintings on a single canvas (6 ft. x 9 ft.) which he entitled "The Gallery of the Louvre." He planned to complete "The Gallery of the Louvre" when he returned home to Massachusetts and to earn an income by exhibiting his work and charging admission. This was typical of Morse, who stumbled haphazardly from one money-making scheme to another. On the sea voyage home in 1832, Morse encountered Dr. Charles Jackson of Boston who was well schooled in electromagnetism. Morse witnessed various experiments with Jackson's electromagnet, and in the course of the six-week voyage, Morse became hooked on the concept of a telegraph. It is said that he was already devising his code even before the ship docked. Around this time he was appointed to a professorship at the University of the City of New York (now New York University), a position he would hold for many years. Upon his return from Europe in 1832, Morse began tinkering with crude prototypes of the telegraph, but struggled with the problem of getting a telegraphic signal to carry over more than a few hundred yards of wire. He also suffered from lack of financing. His breakthrough came from the insights of Professor Leonard Gale, who taught chemistry at New York University (a personal friend of American physicist Joseph Henry). Morse and Gale were soon joined by a young enthusiastic man, Alfred Vail, who had excellent skills, insights, and money. Morse's telegraph now began to be developed very rapidly. By 1837, Morse soon was able to send a message through ten miles of wire. The secret to long distance transmission was the installation of electrical relays that would boost power along the transmission cable. In 1838, a trip to Washington, D.C. failed to attract federal sponsorship for a telegraph line. Morse then traveled to Europe seeking both sponsorship and patents, but in London discovered that, due to an already established patent, no patent was available for his work. Without funding, Morse's telegraph remained a dream. The situation looked bleak indeed. Morse made one last desperate trip to Washington, D.C. in December 1842, stringing "wires between two committee rooms in the Capitol, and sent messages back and forth—and, for some reason, this time some people believed him, and a bill was finally proposed allocating $30,000 towards building an experimental line. The general public was skeptical, however, and there were also a great many skeptics in Congress. In 1844, a forty-mile line was constructed between Washington, D.C. and Baltimore. The most convincing demonstration was when the results of the Whig National Convention at Baltimore in the spring of 1844, reached Washington via telegraph prior to the arrival of the first train. On May 24, 1844, the line (which ran along the Baltimore and Ohio Railroad between the Capitol and Baltimore) was officially opened as Morse sent the famous words, "What hath God wrought," along the wire. In May 1845, the Magnetic Telegraph Company was formed in order to radiate telegraph lines from New York City towards Philadelphia, Boston, Buffalo, New York, and the Mississippi. Morse went to great lengths to win a law suit so that he might be called "inventor of the telegraph," and promoted himself as being an inventor, in the face of many other claims to the contrary. Morse had been granted a patent in 1840, and a Kentucky court ruled in his favor in an 1848 case. In 1854, the lower court's ruling was affirmed by the U.S. Supreme Court. Chief Justice Roger B. Taney wrote that Morse had been the first to combine the battery, [electromagnetism]], the electromagnet, and the correct battery configuration into a workable, practical telegraph. This did not, however, ensure that Morse could collect all the royalties due him. After 23 years as a single man, Morse married Sarah Elizabeth Griswold on August 10, 1848, in Utica, NY. The couple had four children. The Morse telegraphic apparatus was officially adopted as the standard for European telegraphy in 1851. Great Britain (with its British Empire) remained the only notable part of the world where other forms of electrical telegraph were in widespread use (they continued to use the needle telegraphs invented by William Fothergill Cooke and Professor Charles Wheatstone). Statue of Samuel F. B. Morse by Byron M. Picket, in New York's Central Park, dedicated 1871. Assisted by the American Ambassador in Paris, the governments of Europe were approached regarding how they had long neglected Morse whilst using his invention. There was then a widespread recognition that something must be done, and in 1858, Morse was awarded the sum of 400,000 French francs (equivalent to about $80,000 at the time) by the governments of France, Austria, Belgium, the Netherlands, Piedmont, Russia, Sweden, Tuscany, and Turkey, a sum arrived at by estimating the number of Morse instruments in use in each country. There was still no such recognition in the United States. This remained the case until June 10, 1871, when a bronze statue of Samuel Morse was unveiled in Central Park, New York City. On June 10, 1871, at 9 p.m. "all the telegraph wires of America were connected to a single Morse key, on which Morse himself bade farewell to the community he had created. 'Greetings and thanks to the telegraph fraternity throughout the world. Glory to God in the highest, on earth peace. Good will to men,' ran the message, transmitted by a skilled operator, after which Morse himself sat down at the operating table to tremendous cheers…. In total silence, Morse then tapped out his signature, S.F.B. Morse, and the entire audience rose to its feet in a standing ovation." Morse died on April 2, 1872, at his home at 5 West 22nd Street, New York, New York, at the age of eighty, and was buried in the Green-Wood Cemetery in Brooklyn, New York. William Fothergill Cooke and Charles Wheatstone reached the stage of launching a commercial telegraph prior to Morse. In England, Cooke became fascinated by the electrical telegraph in 1836, four years later than Morse, but with greater financial resources (and tons of ingenuity) Cooke abandoned his primary subject of anatomy and built a small electrical telegraph within three weeks. Professor Charles Wheatstone also was experimenting with telegraphy and, most importantly, understood that a single large battery would not carry a telegraphic signal over long distances, and that numerous small batteries were far more successful and efficient in this task (Wheatstone was building on the primary research of Joseph Henry, an American physicist). Cooke and Wheatstone formed a partnership and patented the electrical telegraph in May 1837, and within a short time had provided the Great Western Railway with a 13-mile stretch of telegraph. However, Cooke and Wheatstone's multiple wire telegraph signaling method would be overtaken by Morse's superior code within a few years. In spite of this statement, Samuel Morse was a generous man who gave large sums of money to charity. He also became interested in the relationship of science and religion and provided the funds to establish a lectureship on "the relation of the Bible to the Sciences." Morse was not a selfish man. Other people and corporations (particularly in the North America) made millions using his inventions, yet most rarely paid him for the use of his patented telegraph. He was not bitter about this. Morse was comfortable; by the time of his death, his estate was valued at c. $500,000. Morse invented a marble-cutting machine that could carve three dimensional sculptures in marble or stone. Morse couldn't patent it, however, because of an existing 1820 Thomas Blanchard design. New York University's core curriculum and list of requirements is known as the Morse Academic Plan (MAP). There is a blue plaque commemorating him at 141 Cleveland Street, London, where he lived 1812-15. ↑ Yale University. An Argument on the Ethical Position of Slavery in the Social System, and its Relation to the Politics of the Day. Retrieved December 10, 2007. Reinhardt, Joachim, "Samuel F. B. Morse (1791-1872) Congo, 1988." 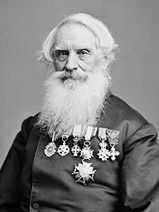 History of "Samuel F. B. Morse"
This page was last modified on 24 November 2014, at 17:22.